With mountains, volcanic lakes, historical temples, and a rich local culture, a Kintamani holiday offers plenty of delights. The spectacular landscape is dotted with villages, and despite the popularity of tourism in Kintamani, the local people continue to live very traditional lives. Make sure to show respect by not trespassing on property or entering temples uninvited, unless to pray. The high altitude means temperatures can drop as much as 15 C (27 F) below those on the coast, so pack a jacket and some warm clothes. To protect against the regular rainfall, also bring waterproof clothing. 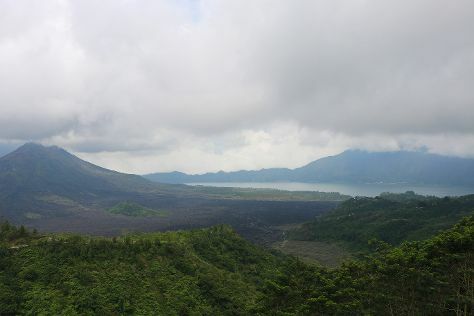 Kintamani is in Bangli. Plan your holiday in Kintamani and other destinations, from the rural, to the urban, and everything in between, using our Indonesia trip itinerary planner. As most visitors choose to stay in other parts of Bali and make day trips to Kintimani, you won't find a huge range of accommodations in the area. Options consist mainly of small guesthouses and bungalows, with only a handful of hotels. Because of their proximity to the start of the trail up Mount Batur, the villages of Toya Bungkah and Kedisan--on the shores of Lake Batur--have the best range of places to stay.